Nice and modern apartment France is located at Francuska street in very hart of Belgrade downtown. 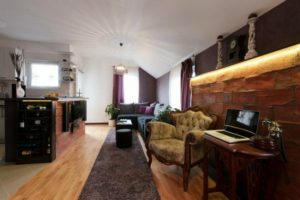 The apartment is situated in a famous Belgrade Street Francuska within very short walking distance of famous Kalemegdan fortress, Knez Mihailo Street and city center. The apartment is equipped with TV, iron, drying fan, microwave, dishwasher, washing machine, bedding, towels… In addition you can find in apartment: cable TV, internet connection and WIFI. The apartment France has a large living room with fully equipped kitchen and a dining area. It also has two bedrooms, one private bathroom and one separate toilet. One of them has a double bed and private bathroom. The second one has two single beds and a writing table. If you travel by car, you can park your car in the garage at the Hilandarska Street or in the street (Zone 3). Please choose 1-2 osobe"3 osobe"4 osobe"5 osoba"